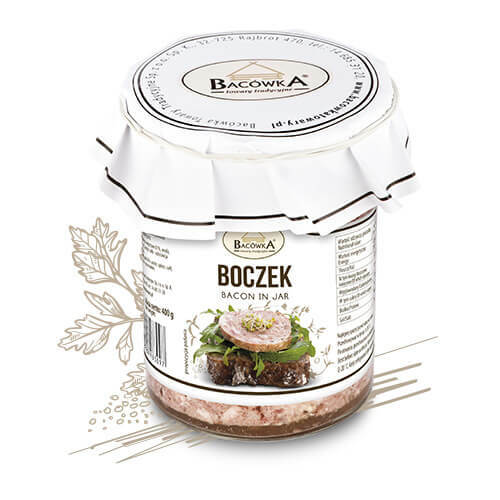 Delicious cold meats from BACÓWKA put in handy jars are perfect for many occasions. 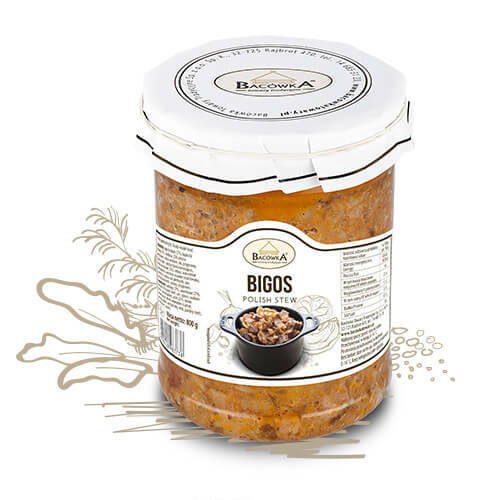 We have prepared this series of products for consumers who remember the taste and aroma of homemade meats in jars, and would like to bring back that unique flavour. 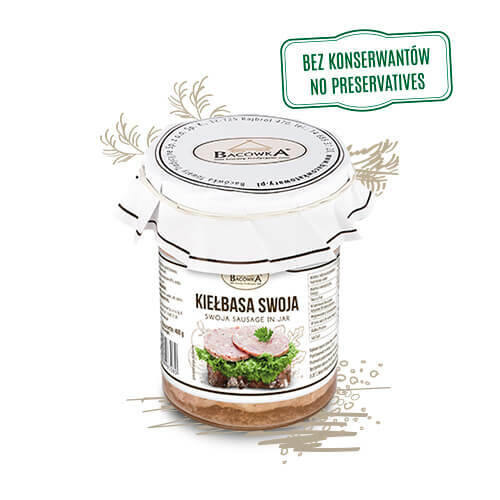 Delightful SWOJA sausage in a handy jar. 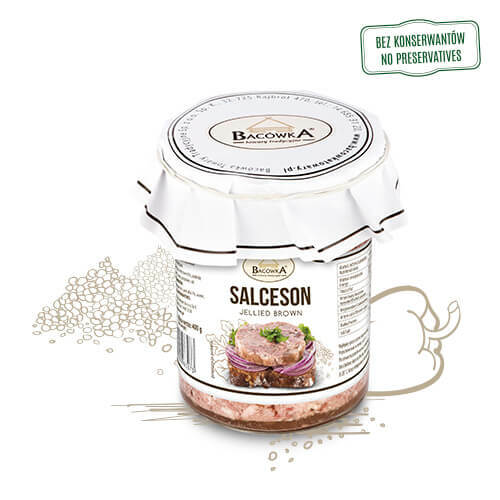 A carefully selected blend of spices with herbal notes brings out its exquisite taste and makes it a delicacy, with a multidimensional flavour and aroma – a gem for connoisseurs of cold meats. A real delicacy for those who appreciate tender juicy and aromatic meats from jars. Delicate chunks of bacon, minced and spiced, delight with their taste and aroma. Ideal for spreading on bread; can be stored in the fridge for a long time. Splendid aromatic and spiced brawn made with tender offal. Especially recommended as a sandwich topping accompanied by vegetables. 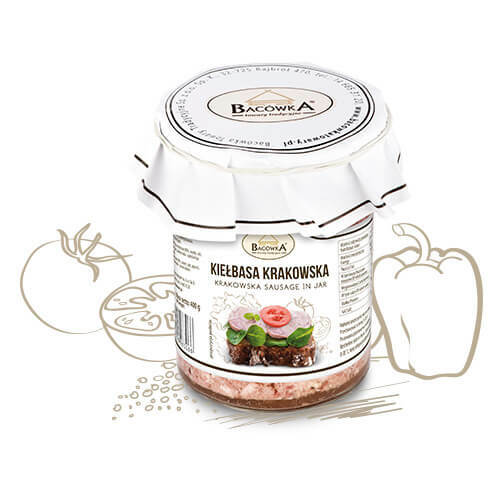 The tasty KRAKOWSKA sausage is valued for its excellent flavour and aroma. A perfect choice if you want to go on a trip and take with you some regional flavour. Excellent stew made according to a well-tested recipe. Mushroom, meat and vegetable flavours merge deliciously with a cabbage and onion taste, creating a wonderful essential dish ready to be eaten just after heating. A classic sandwich topping with a perfect creamy texture and skilfully spiced flavour. Thanks to the handy packaging you can enjoy its taste longer. Delicatessen paté with a surprising note flavour, owing it to the addition of some old plum brandy. Dried plums and a well-composed blend of spices contribute to its great taste and aroma. Especially recommended for connoisseurs of unique dishes. Pure goose fat with an incredibly delicate texture. Ideal for frying, roasting and cooking. Valued not only for its unique taste, but for its beneficial effect on health as well. Splendid lard in a classic combination with onion and greaves. Tastes incredibly delicious with fresh bread and cucumber; an ideal snack for hiking. Excellent lard with a scent of smoked bacon and onion; flavoured with a hint of apple. It is a real delicacy ideal for any feast. Lard with the addition of dried plums, creating a perfect contrast to the taste of lard and onions. It goes perfectly with wholemeal bread and it is difficult to imagine a better snack on a cold winter day.